Elegant and stylish activity tracker. A more elegant looking piece of health gadget than the Misfit Shine Activity and Sleep Monitor can be difficult to find. The device is created by Misfit Wearables and they have designed it as a motivational tool you can carry on any occasion. This elegant gadget fits both men and women. It’s a simple tool that helps and motivates you to move more in your daily life. In addition to tracking your walking throughout the day the Shine tracks running, cycling, soccer, tennis, basketball and even swimming and scuba diving. The Shine fitness tracker is waterproof down to an incredible 50 meters which is way better than the Fitbit Flex and Jawbone UP24. A similar product like this one from Misfit Wearables to a lower price are the Misfit Flash I’ve written about here. The main part of the Misfit Shine activity monitor is a round piece made by diamond-cut, air-craft grade aluminium that’s under 4 mm thick. The piece is very well constructed and you can feel the sturdy quality right away. The small size makes it easy to loose so be careful. The top has a ring of twelve nice LED lights that comes to life when you tap the surface. It shows your daily activity progress. You set your daily goals in the free smartphone app and when the circle is completely lit your goals are reached for that day. The LED lights also function as a clock and once you’ve learned how to use it, which is not that difficult, it works good and is very cool. To see the time simply double tap the top of the Shine and four LED lights light up at 3, 6, 9 and 12 o’clock. Then another brighter light blinks on the hour and another one on the minute slightly afterwards. It’s easy to understand once you have seen it. The Misfit Shine uses an ordinary CR2 clock battery which lasts for between 4 and 6 months before replacement. Most other fitness trackers need recharging often by a USB cable so it’s up to you to decide if you prefer to change a small battery rarely or want to charge every now and then as on other trackers. I think in this case it works very well to replace the battery since it’s always a pain to remember to charge all the gadgets and fitness trackers laying around. The Misfit fitness tracker piece is placed inside the silicone wrist band that follows in the box and makes it look like a modern watch. There are several other ways to wear the Shine, which is bought separately. These include more stylish leather wristbands, a clasp you can attach everywhere and two necklaces. Not many activity trackers have the same possibility to be pimped so it can be worn in even the finest dinner party. All the planning and data viewing is done on smartphones or pads. Ordinary wireless technology doesn’t work with the Shine but it uses Bluetooth LE (BLE/Bluetooth Low Energy) technology to synchronize. Just place the device on the screen or very close to your smart-device and they start communicating. This activity tracker doesn’t collect all the detailed information other trackers might do, but I think you will find that the Misfit Shine collects just enough data. Sleep monitoring, steps, calories, distance and a daily photo journal of the food you eat are possible in the free Misfit app which you can download from Appstore or GooglePlay. An update now makes sure that the Shine works with Android phones too and not only iPhones and iPads from Apple. 8 colors – Black, Grey, Champagne, Coral, Sea glass, Storm, Topaz and Wine. Where Can I Buy Misfit Shine? If you want more info before buying, check out more user reviews here. Do you have any questions or comments on my Misfit Shine Personal Physical Activity Monitor, do not hesitate to send me a message or leave me a comment below. There are a many awesome motivational gadgets out there these days. The clue is to find the ones you like with the functionality that suits you. Right now the Polar Loop is also one of my favorites. Thank you Kathy. 🙂 The discreetness of this device is one if its best “features” i think. Amazing to see what technology can do with our lives now. That is why I always say I am lucky to be witnessing these things happening. Thanks a lot for this. 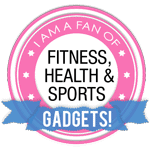 This is a very cool gadget and a great review! I may not be able to resist purchasing one! The gadget design looks really nice and I love the colours! I like that you can wear the tracker as a necklace cause I don’t have a watch wearing habit. WOW that’s pretty high tech! I can’t believe how beautiful the technology is! Very cool post, love the watch!! I want one of these. I’ve not seen anything like this before. Thanks for the information. Wow! This would be cool to have for my next race. I am often put off by those bulky activity trackers, but this one is so sleek and innovative, I am tempted. How on earth does the data transmit to the phone just like that? Any idea on the life-span of this product? Just curious. It’s truly a beautiful activity tracker. The transmission with Bluetooth Low Energy works basically just as an ordinary Bluetooth synchronization, but with far less energy involved to save battery power. That’s why you have to keep the Shine close to your smartphone screen. Misfit has a one year warranty on the product but with ordinary use the main aluminium device will last longer than that. A little bit difficult to estimate the life span. What’s certain is that the rubber wristbands will probably the worn out after a while, but they are cheaper to replace.